CAMP PENDLETON, Calif. —The building has withstood the test of time. It has seen generations of Marines enter and leave its halls. It has seen Marines off to several wars from the shores of Pacific Islands, the mountains of North Korea, the jungles of Vietnam and the deserts of the Middle East. It has served as the operational and cultural epicenter of the 1st Marine Division- the most storied and consequential Division in the United States Marine Corps. It has seen its share of history both for the division and the Corps. The building has even been reviewed as a historical site, still bearing the simple style and white paint associated with World War II era buildings, which were originally meant to be temporary. Few of its kind are still standing across the nation, yet it remains, bold in both color and design, while its peers have been replaced over the decades. If you walk through the musty halls that were once treaded by the likes of Chesty Puller and James Mattis, you can see the artwork – paintings of past commanders, old battle scenes ripped from the pages of history and photos of Marines from modern wars. Humanity creates things that last; tools which pass through dozens of hands before becoming worn beyond use, structures that stand strong for decades, centuries and even several millennia. There are also occasions where we make things for a simple and easy use, where they are only meant to last for short periods of time. Building 1133 of Camp Pendleton, better known as “the white house” was one such structure. Acting as both a headquarters and administration building for the growing conflict in the Pacific, it even expanded to accommodate the needs of the 3rd, 4th and 5th Marine Divisions that also participated in World War II’s Pacific Theatre. In the early years it did not have the nickname “the white house”. It stood amongst many buildings that were painted the same cheap, bare off-white and was not unique beyond its purpose. Styled like many of the buildings to ensure the security of the command, it served many Marines throughout the Pacific for the course of World War II. 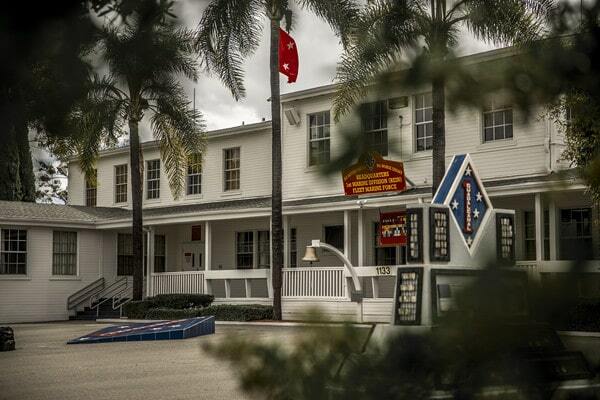 The structure grew upon the Marines that called it home and in 1946 it was officially ordained the 1st Marine Division Headquarters building. This would lead to it being modified decades later, not once, but twice to ensure the building could continue to function and support the many Marines that passed through its halls. Though the renovations have ensured the building has stayed with both the times and technology of the era from phone wiring to internet within its walls, its overall structure and design are still the same as it was when first built. Due to the era in which ‘the white house’ was made, there were many developmental needs required of it during that time. One of the largest was the need to withstand a possible attack. A Japanese invasion of the U.S. was a realistic threat in the 40s. To ensure the safety of the command staff, the building was meant to be indistinguishable from the rest. To those born in the last 40 years, the very concept of a military attack on the U.S. is simply something that would not and could not happen. But in 1940, when Camp Pendleton was officially opened, thousands of Marines marched up from San Diego for combat exercises against a fake enemy. It caused a panic within the civilian population. People initially thought a Japanese invasion had occurred. The base’s presence even led to a drop in the housing market, a fact that is inconceivable to most Southern California home owners today. The threat of attack from the skies influenced much of what would become Camp Pendleton as we know it today. The camps on base are spread wide across the camp’s more than 195 square miles, originally designed to protect the base from being crippled in one decisive airstrike, according to Dowling. In the attics of the White House and other buildings from the era, there is still evidence of the original plywood roofing used. Pressed wood was used at the time for two reasons: actual wood planks were in immediate need to build and replace decks of Navy ships, and pressed wood was less likely to create deadly wood debris if the buildings were stuck by a Japanese bomber. “The white house” was designed by Myron B. Hunt, Harold C. Chambers and E. L. Ellingwood. Their firms handled the development of several buildings across Camp Pendleton during the 1940s. Based on the U.S. Navy B-1 barracks, which was a common design to further make the building indistinguishable from other building on base at the time, making it less of a target for Japanese bombers after Pearl Harbor. Few of these barracks are still left standing after the 70 plus years since their development. The B-1, much like its sibling structure, “the white house” was only a temporary design meant to last for the duration of the war. In 1983 congress would pass the Military Construction Authorization Bill of 1983, which demolished many of the older temporary structures of World War II in favor of new designs. Some structures were renovated due to their historical significance. “The white house” interior was included in these renovations. The building underwent changes to its exterior but maintained its current shape with only a few minor changes. Since its construction many people have entered “the white house” and many more have driven past it. It is an iconic symbol of the 1st Marine Division with dozens of memorials surrounding it, capturing the sacrifice of every Marine who fought with the Division during its many battles through our history. From officers arriving at its doors in 1940 Ford staff cars, to 1968 Volkswagen Beatles, and even more recently, a 2018 name your make and model. When one steps out of their vehicle, they would gaze up at the white building marked by the iconic blue diamond and the battle streamers the division has earned. In the old days it would support the entire command staff, but now much of the command is spread out across Camp Pendleton. Many Blue Diamond alum have even thought of making it into a museum, given the many historical pieces that already line its halls. It gives off that feeling of having entered a place engrained with history. Many of the older veterans were not using to dealing with the commands of the 1st Marine Expeditionary Force, said Sowers. When they thought of “the white house” they’d think of the commanding general who presided over all they knew of the Marines on the West Coast at that time. Generals, majors, sergeants and lance corporals have walked its halls over the last 70 years. Some still live amongst us while others have given the ultimate sacrifice. Their memories and actions live through both the 1st Marine Division and “the white house” itself, which has been an unchanging monument to the Marines of the 1st Marine Division. No matter the age in which one served the Division, all have known that building in one way or another. It is a testament to both the Division and the Marines that have served. Our ideals have become engrained into its very structure and it has become a permanent member in both the hearts and minds of the Marines of the 1st Marine Division.